As people age, they commonly experience changes such as decreased balance and declining vision that can lead to falls and other accidents, according to the National Safety Council (NSC). Certain aspects of your home – such as stairs and throw rugs – can become safety hazards. More than one out of four older people falls each year, according to the Centers for Disease Control and Prevention. Fortunately, it’s possible to adapt your living space to account for the effects of the aging process and reduce your risk of injury. For homeowners who want to age in place, the right team of designers and planners can modify a living space for optimal accessibility as well as aesthetics. These are just a few recommendations it’s important to keep in mind when creating a safe place for seniors. Additionally, the NSC recommends clearing away anything on the floor that could cause someone to trip and fall. That includes throw rugs, electrical cords, and other kinds of clutter. 2. Add grab bars and railings to help with stability. Installing grab bars inside and outside the tub or shower as well as next to the toilet reduces the risk of falling for seniors, the NSC states. Railings on both sides of the stairs are also a good idea. 3. Light the way but avoid glare. As we age, it usually gets more difficult for us to adapt to changes in light levels and see things in low lighting, according to the Global Journal of Health Science article “Design Principles to Accommodate Older Adults.” That means seniors need higher levels of lighting, particularly in areas like walkways and stairways. However, another effect of aging is higher sensitivity to glare, so in addition to greater illumination, a home designed for older occupants should include matte surfaces instead of shiny ones, especially when it comes to flooring. 4. Make it easier to do things from a lower position. 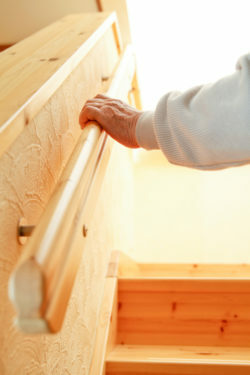 For seniors who have experienced a decrease in stature and/or who use a wheelchair, designers can make life easier by making things accessible from a lower height, according to the NPR article “Building Homes to Age In.” For example, accommodations might include lower shelves and an open area under the kitchen sink to allow residents to do the dishes while sitting down. 5. Account for changes in temperature sensitivity. Older people tend to become more sensitive to low temperatures and have reduced reaction times to high temperatures, according to the Global Journal of Health Science. As a result, it’s recommended to install features that warn residents of high temperatures (e.g., an H that lights up next to hot stove burners), as well as products that protect against burns (for example, stay-cool handles for pots and pans). Additionally, homes for seniors should have a minimum temperature of 65ºF. These are just some of the factors to keep in mind when opti-sizing a living space. If you’d like to learn more, our team of Evanston senior move managers offers comprehensive design and planning services for seniors who want to age in place. Feel free to contact us today by calling 847-769-2412 or emailing drina@dwelling-sp.com.